2017 is the second year Kyorin University has hosted students from Texas A&M University for a 10-week study abroad experience.For A&M students, it is a precious experience. A&M students have made many good friends at Kyorin because the university arranged for Kyorin students to be ’kaiwa partners’.This arrangement gave A&M students conversation practice and friendships.In addition, A&M’s relationship with Kyorin University gave A&M students the opportunity to make other important relationships. One day in July, Kyorin University arranged a visit to Kanto Kokusai High School for the A&M students.This was the A&M students’ first opportunity to experience what life is like for Japanese high school students.The Kanto Kokusai High School faculty planned carefully.A&M students formed groups with Kanto Kokusai students for interviews and free conversation. 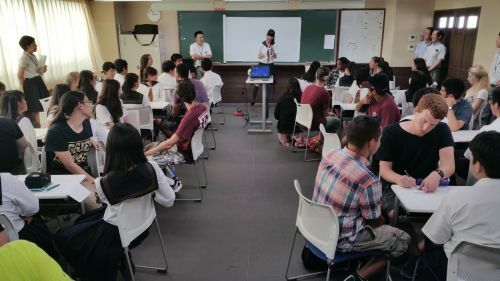 The experience at Kanto Kokusai High School shows the importance of A&M’s relationship with Kyorin University.Students of foreign languages can learn grammar and vocabulary in the classroom, but only personal relationships can provide experience with communication.Kyorin University is a rich environment for A&M students, and mostly it is rich in opportunities to meet and talk to Kyorin students. 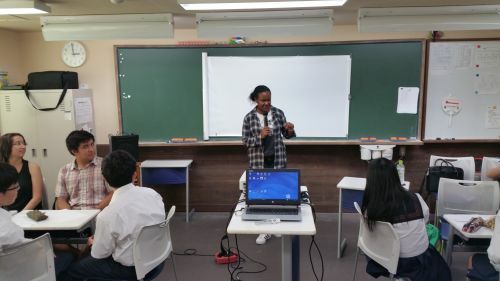 Thanks to Kyorin University students, A&M students have formed memories and relationships, as well as enriching their own language skills.Thanks to Kyorin University’s staff and faculty, these memories and relationships include an afternoon with the students at Kanto Kokusai High School. We hope Kyorin University and Texas A&M University will be able to continue this rewarding relationship in the future.